The Jazz & Rock Schulen Freiburg (J&RSF) is the competence center for popular music in the German Southwest. Around 1500 music enthusiasts of all ages and levels receive highquality instrumental and singing lessons, visit bands, ensembles or choirs and take part in regular workshops, projects and events. With more than 30 years of experience and an excellent teaching background, J&RSF guarantee their students a successful learning experience in all popular music styles and instruments. The J&RSF is very well networked internationally: In addition to the Berklee International Network, the J&RSF is a member of the International Association of Schools of Jazz, the European Modern Music Education Network and the Bundesverband für Popularmusik e.V., just to name a few . 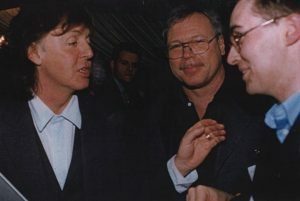 Partnerships with Paul McCartney’s Liverpool Institute for Performing Arts, the Helsinki Pop & Jazz Conservatory as well as the Popakademie Baden-Württemberg and Landesmusikrat Baden-Württemberg e.V. enrich the school life at regular intervals. The J&RSF is home to hundreds of musicians – stage professionals, professors, students and hobby musicians. A unique melting pot that releases a lot of creative potential. Your are interested in J&RSF and what we offer? You have some questions about learning an instrument, singing in a professional way, playing in a band around here…? Please feel free to contact us, it would be a pleasure getting in touch with you.